Round 3 sends us north once again, the tarmac of the A1(M) beckons as the annual pilgrimage takes to the Teeside Autodrome. From 2004 the expanded karting track has welcomed bikes and cars to its unique racing lines and once again the BDC is at home. There for 2 days of sideways fun. 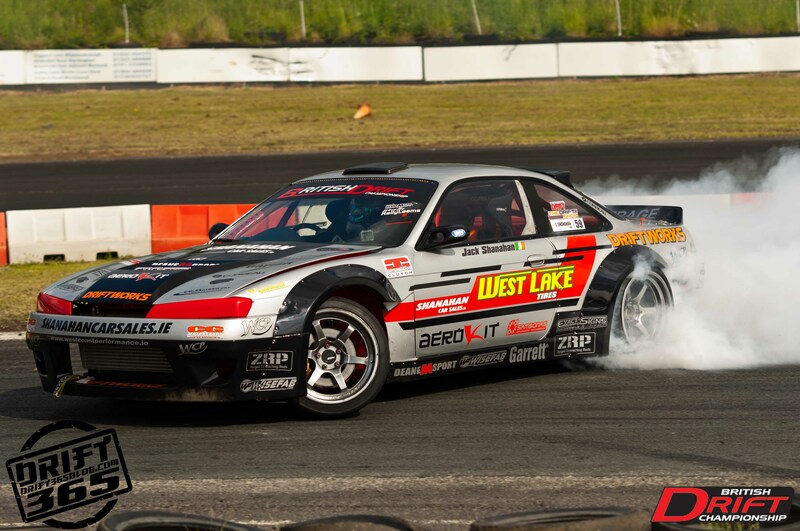 The usual suspects are in attendance with Pro Am on Saturday and the Pro class on the Sunday. 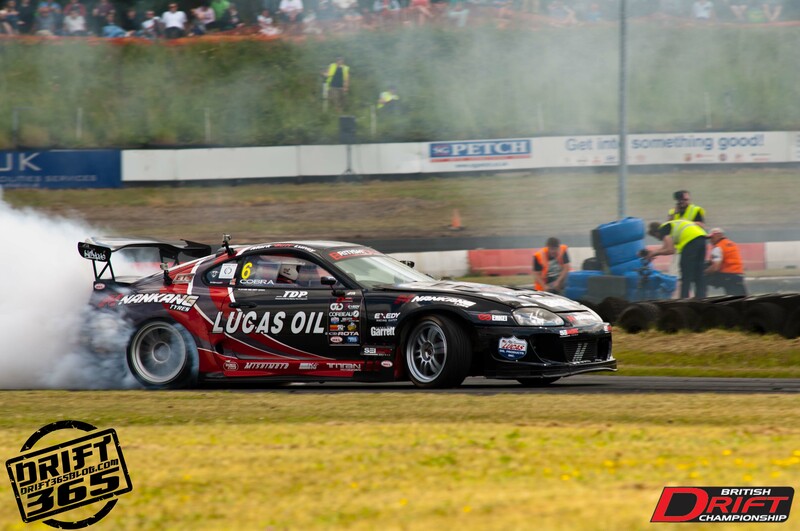 My second visit to professional competitive drifting having missed Knockhill due to some 51 degree sun stopping me from attending but here I am heart and soul. The weather is hot and the visibility is clear. The wind is blowing in the right direction to clear the ever impending tyre smoke, mind you it never moves quick enough for the photographers. The days run to plan, practice, qualifying rounds and knockout battles come wave after wave. Never having been here before my targets were set low, footage and lots of it please. The layout of the track comprises of the standard collection of bends, short, hairpin and one long sweeping right hander. Also the pits make up the rest of the track. My thoughts that the track officials(NADT Management) using bikes didn`t factor in to start with but then after extensive track walks it makes total sense. The practice sessions commenced with the heat increasing on both sides, trackside and in the drivers seats. 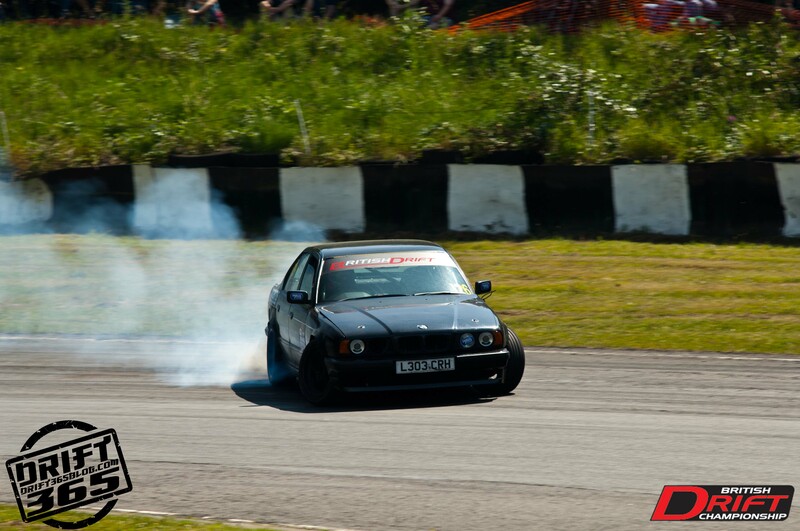 Smoke builds and tyres degrade. Tempers flair and machines fail, all in a days work. The V8 powered Laurel of Karl Farrer decided it didn`t like his choice of oil and promptly deposited it around three quarters of the active track. Little did I know that I would be roped in to clear the mess, banger track management has taught me well. Sweeps the invoice is in the post. Track clear-ish, car fixed, Karl pushed through qualifying and onto a close fought battle with the white BMW Touring of Fraser Stark. Unfortunately missing out on a place in the top 16. 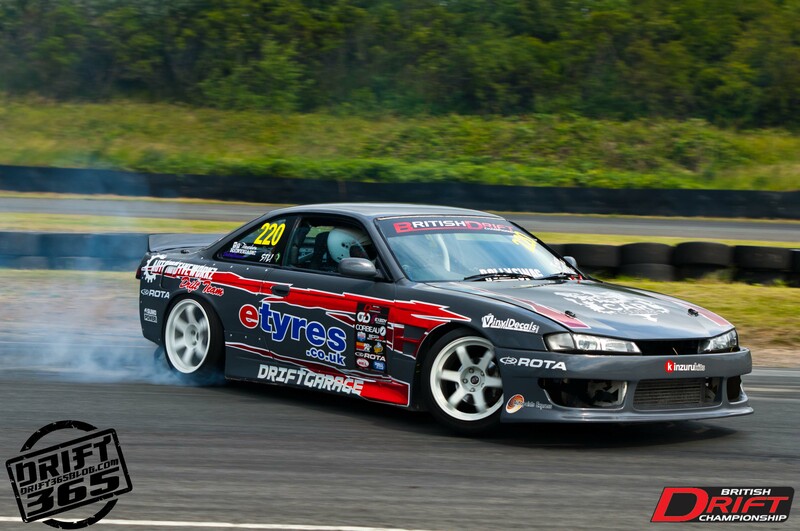 Another well turned out competitor saw Jamie Owen qualify second in the Pro Am class. His top 32 run saw him against a seasoned track specialist in Chris Smith. A win saw him move onto the final 16. 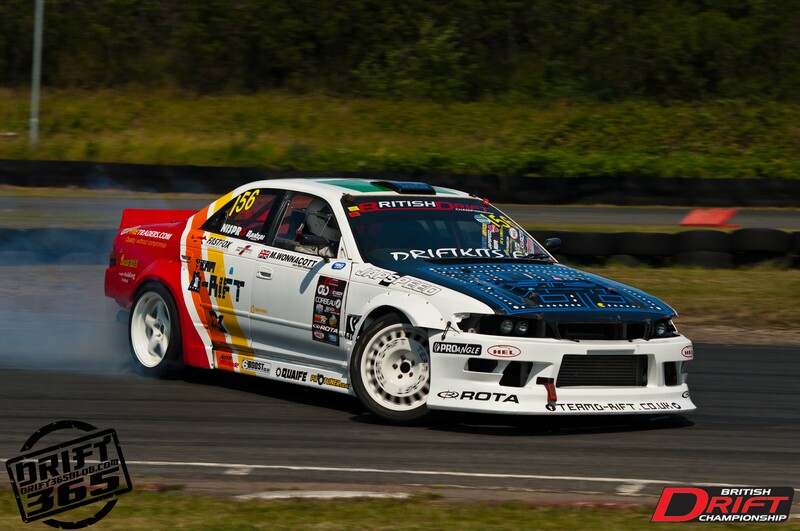 That result concreted his permanent spot in the BDC Pro Am class for the rest of the season. 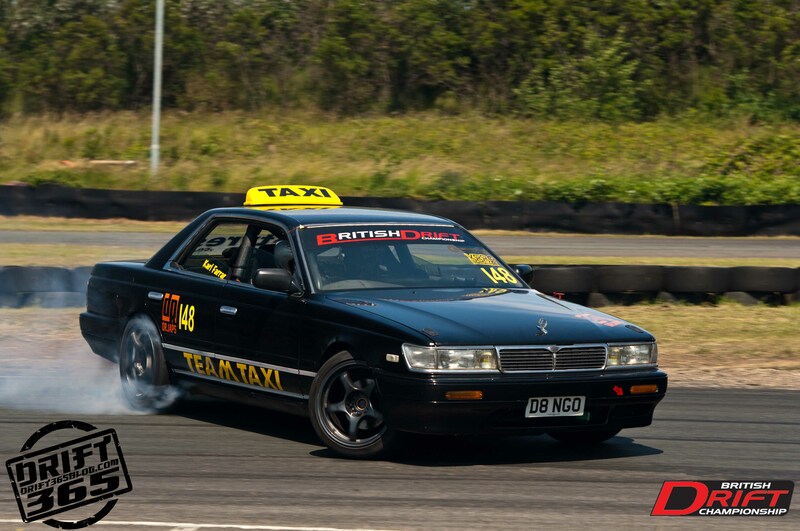 Battles were hard, smoke levels were high but the drivers prevailed, and Louis Geldart in the glorious V8 Geldy Interceptor took the well earned first place, over a gracious Slide Motorsports Matt Stevenson. 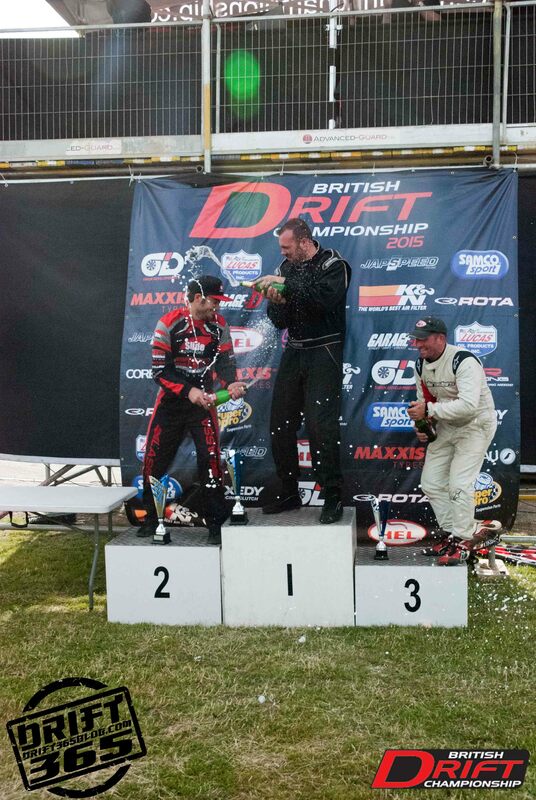 The podium was completed by complicated equal third between Martin Wonnacott and Bradley Walbank. 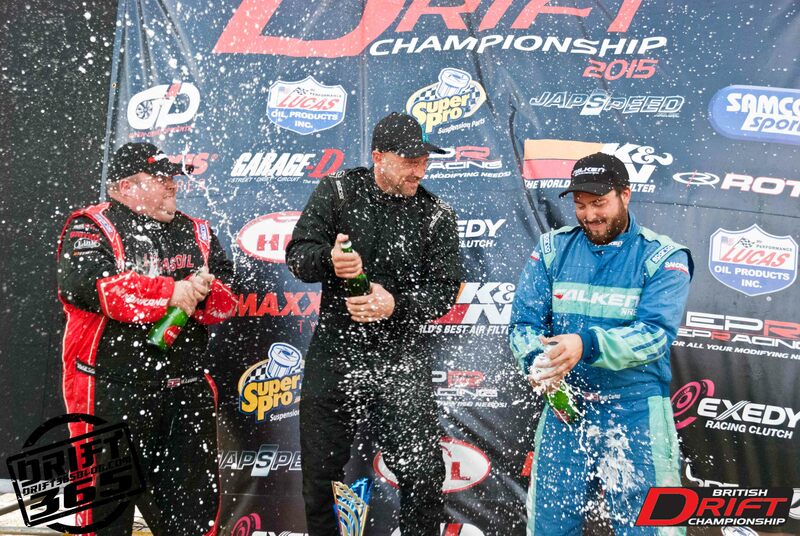 The corks popped and the fizz exploded to draw the closure to day one and the Pro Am Class. Day two commenced the usual briefing followed by Pro practice. Much the same as Saturday, the drivers always bring the noise, hard driving by all, “MAN-FOOT” as Sweeps calls it!. The weather was dry and damn hot, whilst this always provides a great viewing spectacle for all heavily degrades the tyres. Teeside provides some great vantage points for all to see and the crowds were out in force supporting their favourite driving stars. Let battle commence. Norfolk regular Ian “Bizz” Phillips found himself up against another Norfolk face Team Japspeed driver Paul “Smokey” Smith. Paul progressed through to meet the Nissan GTR of Simon Perry. 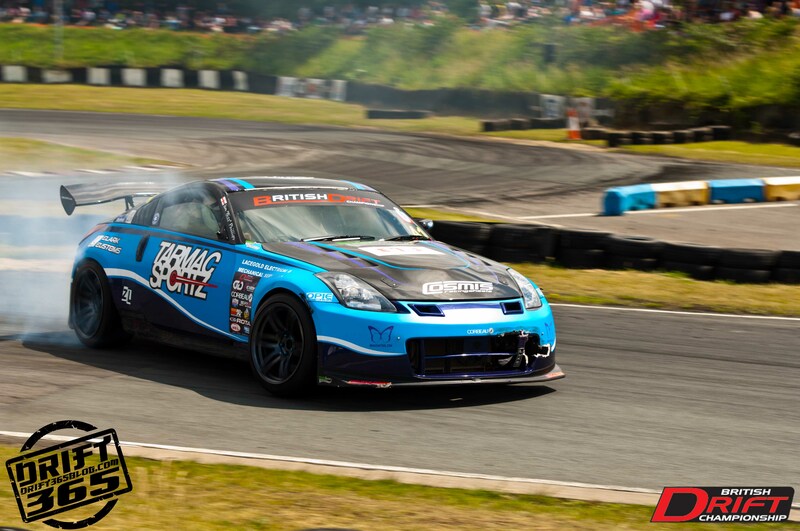 A new build this year the GTR is still in shakedown mode but this doesn`t stop Mr Perry. Lighting the tyres at every opportunity. 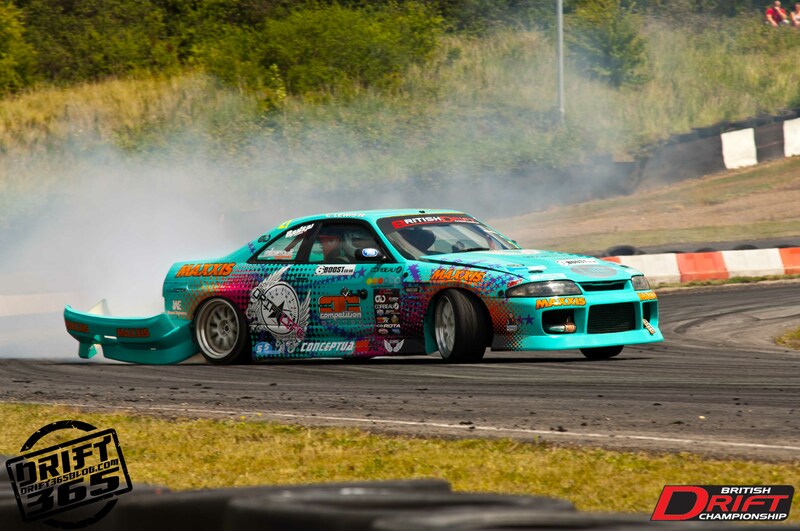 Another local lad Christian Lewis in the It`s a DRIFTlife Skyline was matched up against the BMW of Team MnM driver Jay White. 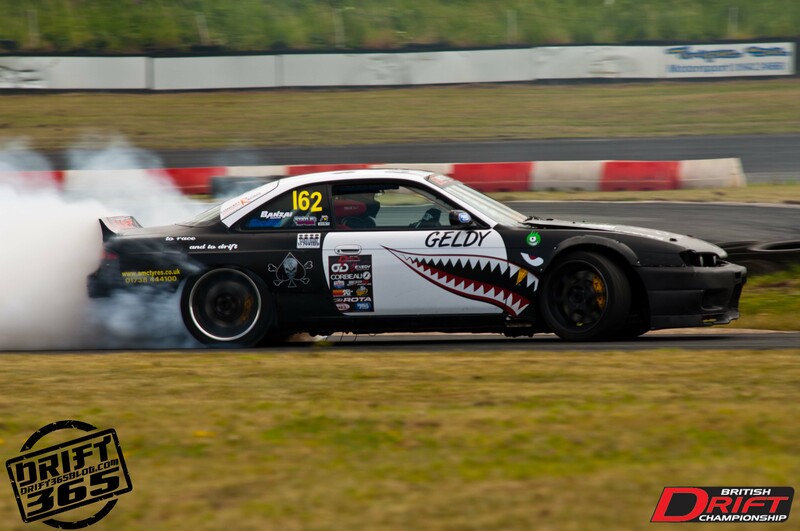 A successful driver progressed him through the top top 32 only to lose out in the top 16 to another Team Japspeed driver, Shane O`Sullivan. 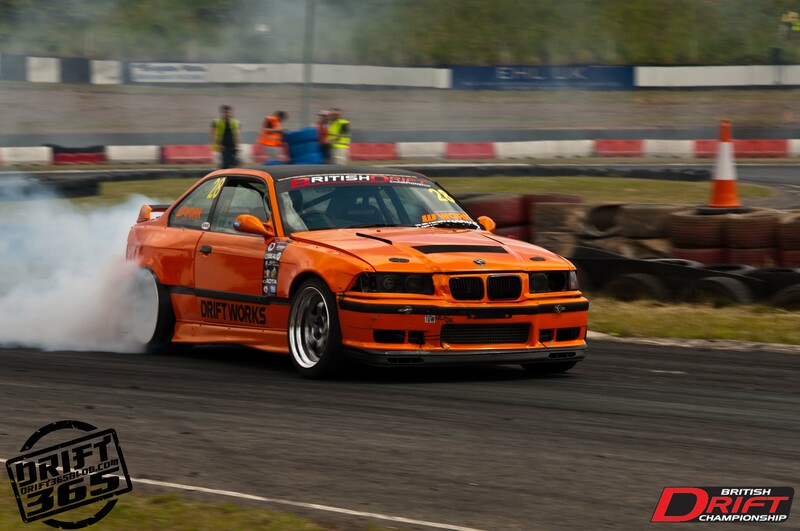 Pro Am class winner Louis Geldart along with the other podium winners from yesterday qualified to run in the Pro class, battled hard but losing out to the Team Driftworks BMW E36 of Richard Grindrod. 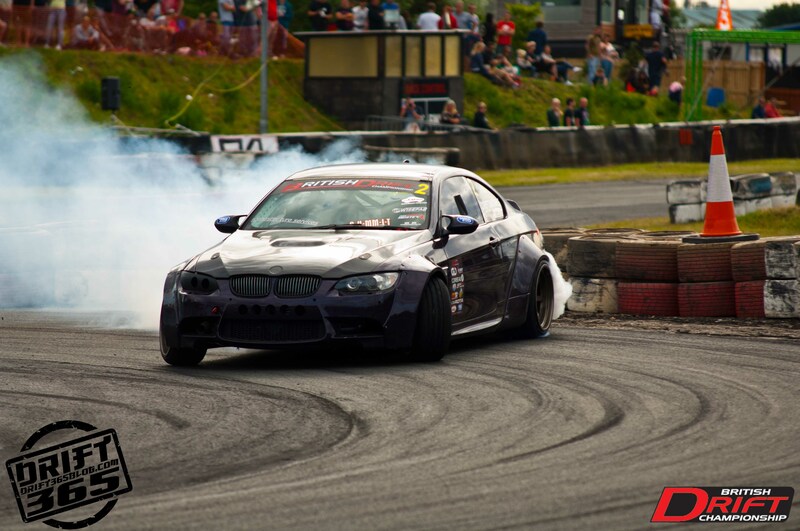 His day was over in the next round to Nangkang Tyres Drift Team driver Mark Luney. 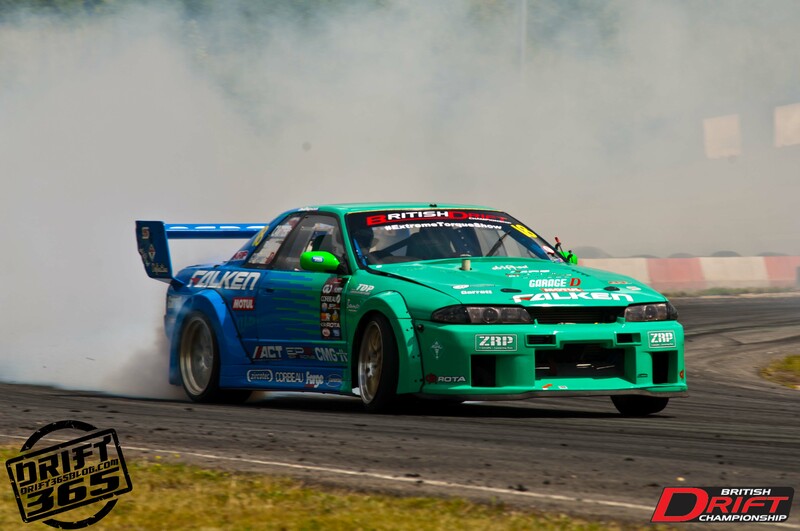 So the final battles inevitably came round, Michael Marshall`s E92 M3 BMW found himself up against Mark Luney and teenage superstar Jack Shanahan in the 700bhp S14 versus Matt Carter in his 650bhp Nissan R32. Podium places went to Michael Marshall in first followed by Mark Luney, then Matt Carter with Jack Shanahan as the runner up.